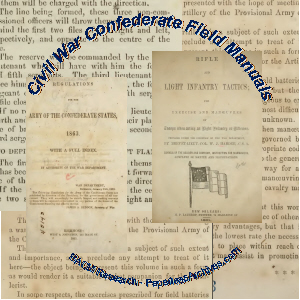 12,553 pages of field manuals printed in the Confederate States and used during the Civil War by Confederate forces. 70 volumes of text covering military tactics, logistics, regulations, ordinance, medicine, adjudication, and other topics related to raising and maintaining a fighting force. These volumes were printed in the South during the Civil War. 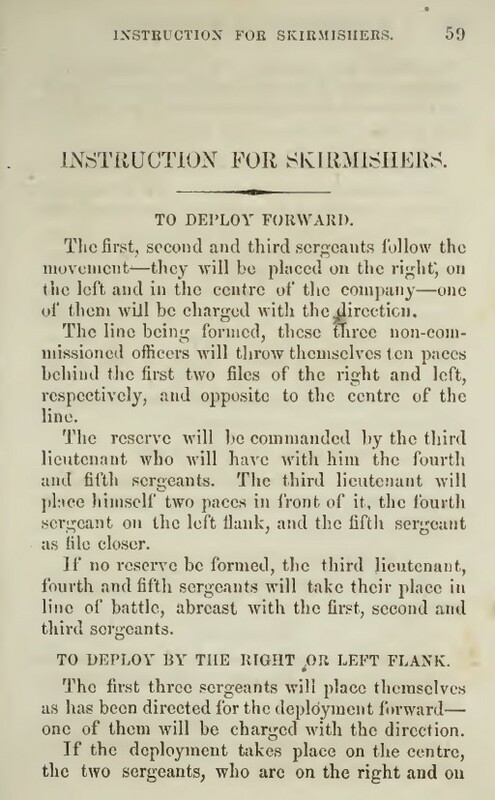 Volume 1 - Schools of the Soldier and Company Instruction for Skirmishers, by Col. W,J. Hardee Confederate States Army. From the Preface: "The following compilation originated in an attempt to adapt Lieut. Col. Burns' 'Questions and Answers on Artillery' to the United States service. The British Artillery being very different from ours, it was found necessary to omit many of Burns' questions, and to introduce others." 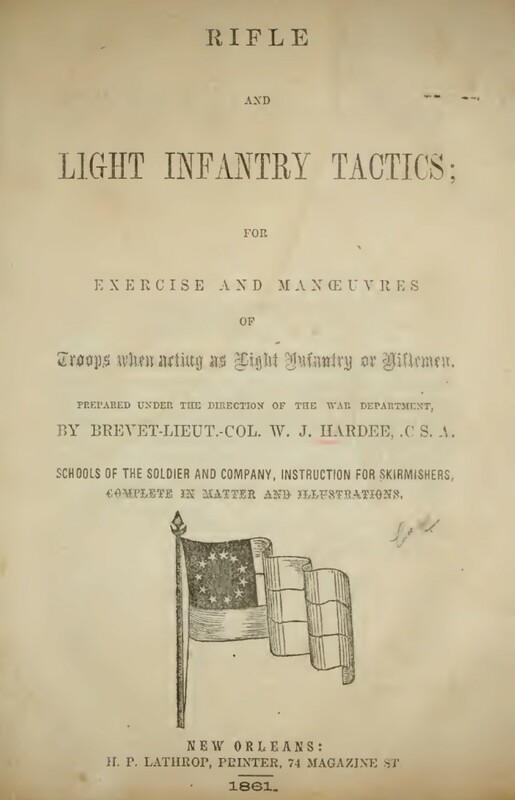 Manual of Instruction for the Volunteers and Militia of the Confederate States by William Gilham, Colonel of Volunteers, Instructor of Tactics and Commandant of Cadets, Virginia Military Institute. 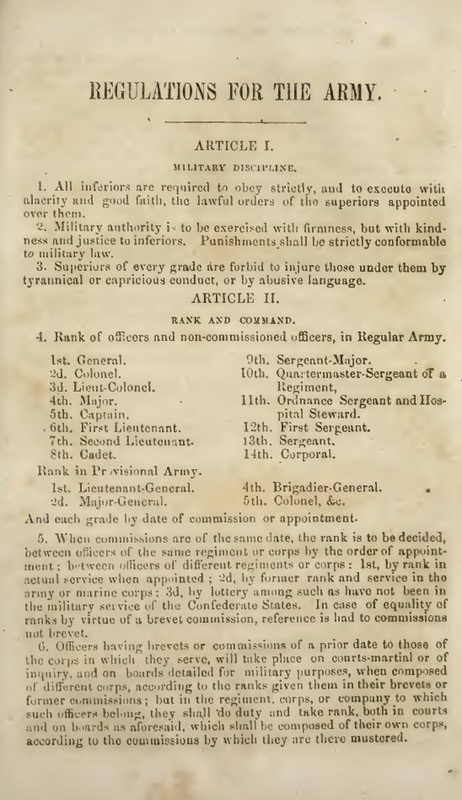 Compiled by Captain R. C. Gilchrist, acting Judge Advocate General, Department South Carolina, Georgia, and Florida. 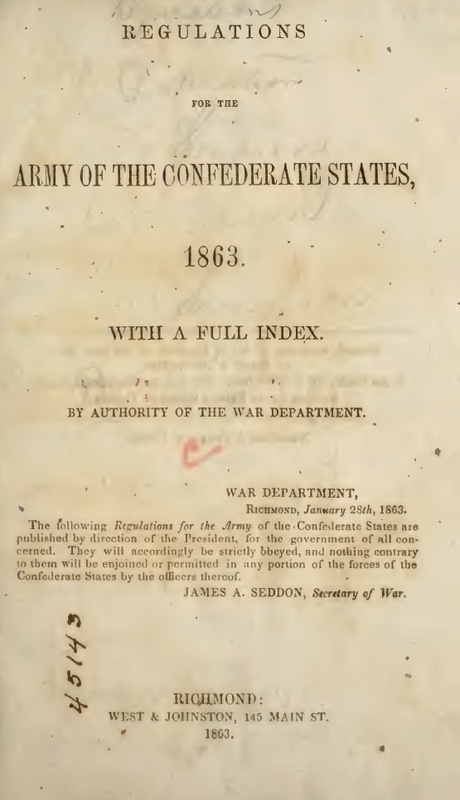 Full title: Regulation For The Army Of The Confederate States, 1864. Revised And Enlarged With A New And Copious Index. Third And Only Reliable Edition, In Which Are Corrected Over 3,000 Important Errors Contained In The Editions Published By West & Johnston. 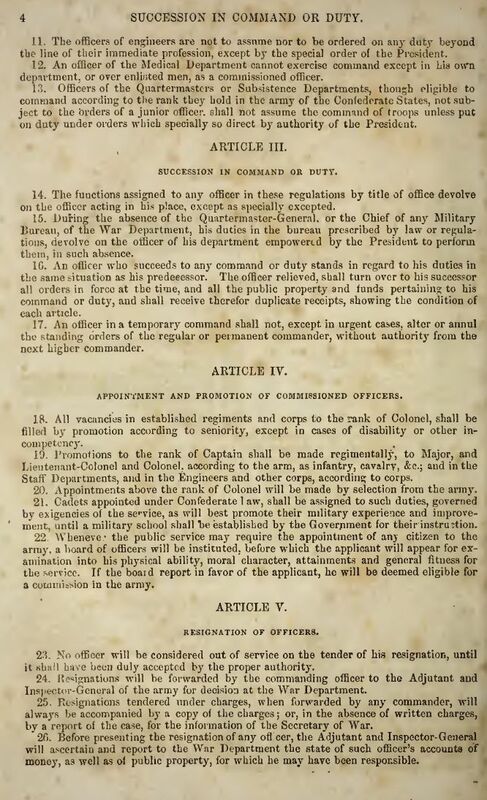 From the introduction: The following Regulations for the Army of the Confederate States are published by direction of the President, for the government of all concerned. They will accordingly be strictly obeyed, and nothing contrary to them will be enjoined or permitted in any portion of the forces of the Confederate States by the officers thereof. James Seddon, Secretary of War. 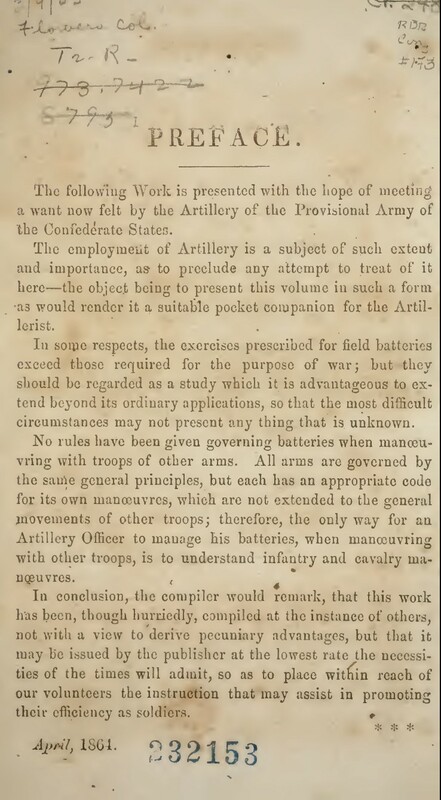 From the preface: The writer, having had access to several interesting works on the subject of artillery that are now very difficult to obtain, has concluded to publish these "Notes," hurriedly written, as they have been, in a few spare days. He does so with the hope that they may interest and instruct his fellow-comrades in arms, especially those who have lately entered this arm of the service, and may in some remote degree aid the great cause so dear to his heart. Headquarters Hindman's Division, McFarland's Spring, Sept. 4, 1863. General Orders, No. 8. By command of Major-General Thomas Carmichael Hindman, with J.P. Wilson, A.A. General. Published by Parrish & Willingham. General LeLouterel's Work, (4th edition, Paris, 1850), of which this is, in the main, a translation.